Posted on November 12, 2014 by staceyanderton1	in Sports and tagged Saegertown softball, SHS. 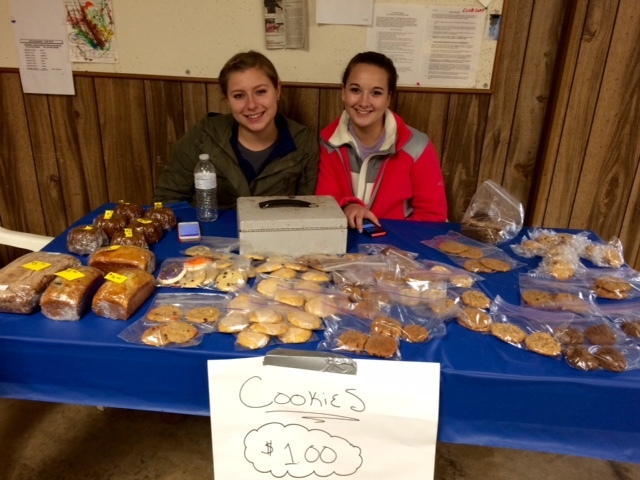 Karleigh Ashbaugh and Brittany Sample sold baked goods as part of a recent softball team fundraiser at the Saegertown Sportsmen’s Club. The Lady Panthers softball team got an early start on their fundraising this year. On Sunday, October 26 from 9 a.m. to approximately 2 p.m., they held a competitive trapshoot to raise money for the team’s second trip to Cocoa Beach Softball Spring Training in southern Florida that is scheduled for April. The shoot was held at the Saegertown Sportsmen’s Club. Community member Darin Ashbaugh, who came up with the idea, said, “It was a good way to raise money in a family environment.” At the shoot, the team offered a lunch, bake sale, Chinese auction with various prizes provided by local businesses, and tickets for a gun raffle. There were nine different classes of shooters such as a women, juniors, first-timers, and several regular classes. Hunter Peters, a junior at Saegertown and award-winning shooter, said, “It was a good time. There was cool prizes and the food was delicious!” Approximately $1800 was raised at the event. “It was good that the team can come together to raise money for the trip to Florida,” said senior catcher Jess Tomiczek.